For years I hung on to my LP (EMI Melodiya ASD 2973) of this wonderful recording in the hope and belief that one day Melodiya would bring it out on CD. I was thrilled when it finally appeared in this handsome new issue. The sound is excellent for 1965 and authenticity infuses every note. I have tried many, many recordings since I first heard this one, and none approaches it - least of all those worthy efforts by British choirs, so shamelessly hyped by my compatriot critics, nor those by Finns or Swedes. The basses in those choirs invariably bring Dr Johnson's dog to mind with regard to that famous low B-flat, more than two octaves below middle C, at the end of the Kiev chant. 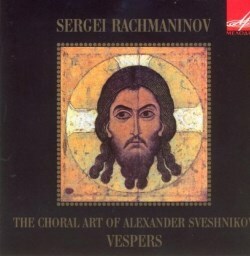 No choir has ever had such basses nor ever been recorded in such an atmospheric acoustic as here in the State Academic Russian Choir, under Sveshnikov. Nor has any other conductor ever judged the tempi so aptly, nor understood the need to steer a middle course between lugubrious, enervated solemnity and undue haste. Nor have the soloists been matched for their sincerity and beauty of utterance; a fruity, wobbly mezzo such as we hear in Georgi Robev's Bulgarian recording for Vanguard is a disaster - although his tenor is rather good. Far preferable are Klara Korkan's simplicity and Konstantin Ognevoi's plangent, grainy tenor, so Russian in timbre. If you need to economise, there is a good, rather too brisk but still very Russian-sounding performance of the Vespers by the Ukrainian "Dumka" Choir as part of a super-bargain three disc set by Brilliant Classics which also offers the Tchaikovsky Liturgy of St John Chrysostom (and there are other variants in the Brilliant catalogue), but my advice is to acquire this one at all costs. It is redolent of candle smoke, bejewelled golden icons and cavernous, chilly cathedrals - a desert island disc.